I want to have a SL course that takes full advantage of the iPad (not the new iPad3) width in landscape orientation. My file does not have a top bar, nor a menu; only the player controls at the bottom. Taking into account the space taken up by the Safari browser bar, the SL left and right borders and the player bar at the bottom, I figure the dimensions of my file should be set to 1006*610. However, when I publish and run the SL file, there is quite a bit of "wasted" space to the left and right. Also, my size setting don't seem to have any effect in the player app. What am I missing? Is my math wrong? In the iPad app we will always optimize the size to display it at the biggest size possible. Can you share a link with me to the HTML5 output so I can see what it looks like on an iPad? Hi Dave, thanks for getting back to me. 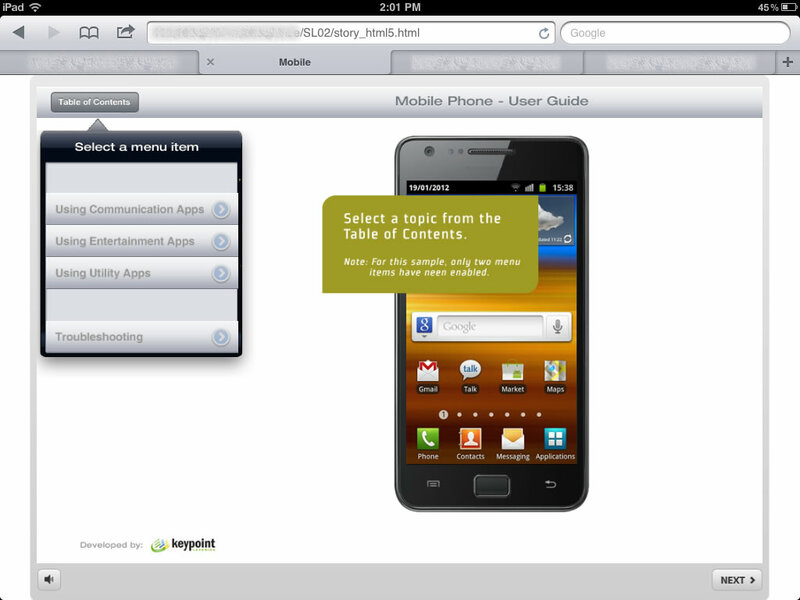 See attached a screenshot of a sample course in HTML5 and in the player app. In both cases, the content is scaled down and not shown in its intended width (1024px). There is a lot of "wasted" screen real estate to the left and right in the browser and all around in the player app. Yeah, in the app right now we will always have the grey area around it unless you launch it in full screen. If you reverse pinch it will maximize it to the full available screen area. Sorry, my wording above was poor. In the HTML5 output it looks like you have an aspect ration of about 1.4 for the entire player, but the display area that you have available there in landscape mode has an aspect ratio closer to 2048/1346 = 1.5, so if you want to optimize the HTML5 output so it fits perfectly with no padding in HTML5 you would need to make the output (including the player size) closer to an aspect ratio of 1.5 width to height, so right now your presentation is too tall to use up all the available space. Do you have any suggestions for width and height for the actual story size? Given that the HTML5 output will be used on iPads and normal browser, is there a size that you wouldn't go above? For the story size I would stick with the default 720x540, because in the Articulate Mobile Player, when they go full screen it will be optimally sized for the display. In HTML5 on the iPad we will scale to fit the view port, so size doesn't matter, it is just the dimensions. Just keep in mind, if you make a presentation ridiculously large, and then display it on a smaller screen it will be harder to see. Thanks for your feedback. The tricky part is that the screen dimensions change depending on which player controls are used. I am building a project that doesn't use any player functions, I believe that the best dimensions end up being about 1:52 or something very close to that. However, after creating the project at 800x520, the image is quite blurry when viewed on the iPad. If my module is primarily for the iPad... how big would you recommend it? is there any way to disable or change the code so that the html5 version on an iPad is not stretched? my exports are coming out very blurry on the iPad. Just linking Jackie's thread to this thread too. >i wanted to know if you there is a way NOT TO force the HTML5 export to view port. Peter does mention in the thread below that HTML5 does have it's limitations at this point. This is a good article on some of those limitations. I believe the fundamental limitation is (and may always be) how your user interface is constrained to fit the HTML model. 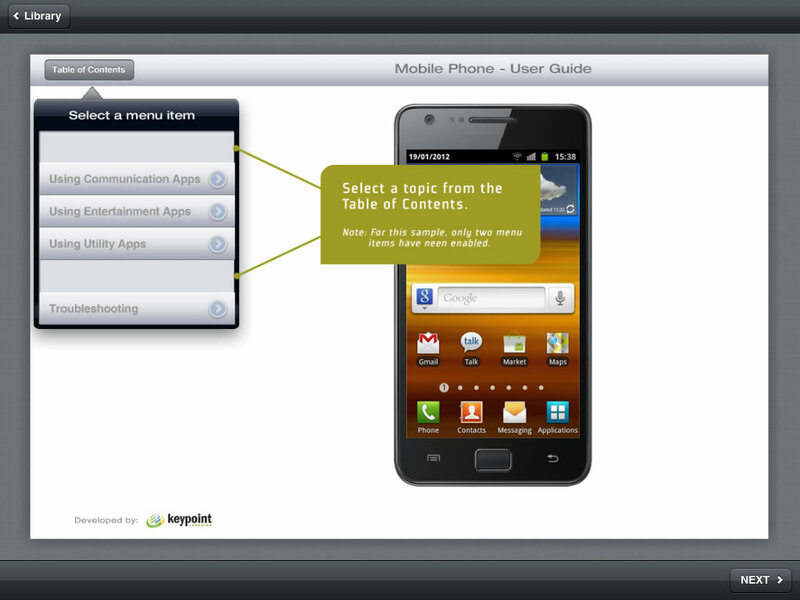 Your app will look and feel like a web app, with web-style user interface controls and touch handling.